The following enhancements have been made to the On Demand Admin Portal since it's relauch in January, 2016. With each update, we strive to improve the overall user experience and introduce new features based on customer requests and online media best practices. To suggest an enhancement or for more detailed information about any of these changes, please contact video.support@infobaselearning.com. Admins can control whether their users see the new Social Sharing options by enabling this feature in the Account Settings section of the admin portal. Admins can now create MARC Records on request within the Admin Portal. This new feature provides admins with more flexibility and control over how they receive their MARC Record files for their On Demand videos. To learn more about using the MARC Record tools, click here. Admins can now turn off the video content warnings that display at the start of any content marked as requiring viewer discretion. This option is in the Account Settings section of the Admin Portal. To learn more about content warnings in general, click here. 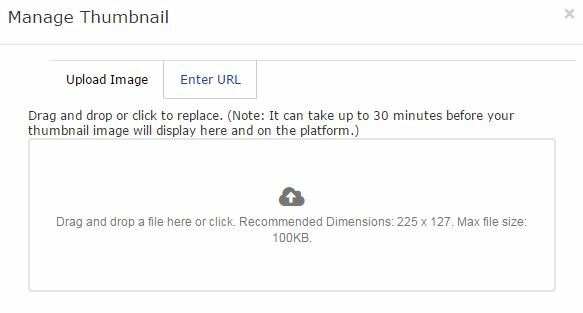 In addition to specifying a URL for custom content thumbnails, admins can now use the new image upload tool to upload thumbnail files into Learn360. This makes the custom content management process more seamless for admins. Admins can now control which citation export tools display for the users in their account. All options will display by default, but any or call can be easily turned off in the Account Preferences section of the Admin Portal. Account admins can now search for and find generic users in their admin portal. These users can not be edited, but admins can view the username and password for each. Admins can now include multiple email addresses when they schedule a report to be run on a regular basis. To read more about scheduling reports, or click here to read the help article about this option. And many of the pre-made and custom report options have been fine-tuned to improve their speed. LDAP authentication is now available for all institutions using an LDAP server to manage their users. To learn more about LDAP and how a you can start the process, click here to read a detailed help document. On Demand now offers an API for discovery tools to access meta-data about all available content. If your institution is using a discovery tool or federated search tool for video content, you can now access updated meta-data in real-time through our API. To learn about this new option, click here to read a detailed help article. Or, contact our Support team at video.support@infobaselearning.com with any questions or help getting this new feature up and running. Admins of large consortia are now able to select different account preferences based each Org Type (College, Community College, Technical School, etc…) and each User Type (teacher, librarian, student). This includes things like the default citation format, available page tools, download options, and even the new caption options. Each Org Type/User Type combination can have a unique set of settings. Admins can now set default preferences for the way closed captioning text displays on the screen. A default font size, font family, and font and background color can be preset for all users within an account. To learn more about using this new feature, click here. A new usage booster is now available - the Preview Widget. Admins can create widgets by selecting specific videos from their collection to customize the content. They can then place the widget HTML on any website, giving users free "preview" access through an embedded On Demand video player to view the first segment of all the selected videos. To learn more about creating a preview widget, click here. Admins are now able to activate Google Sign In for their users to be able to access On Demand using their Google credentials. If you are a GAFE school, this provides an easy way for students and faculty to link their Google accounts with their On Demand accounts. To learn more about how this new feature works, click here to read a detailed help article. Or, click here to learn how to activate this option for your account. Please contact our Support team at video.support@infobaselearning.com with any questions or help getting this new feature up and running. Admins are now able to select different Web Channels and setup different Featured Titles based each Org Type (Elem, Middle, High School, College, etc…) and each User Type (teacher, student). This allows admins to have complete flexibility about what content each type of school and each type of user will see for Web Channels and Featured Titles. To learn more about activating and managing Web Channels for your account, click here to read the help article in our Support Center. To learn more about setting up and using the Featured Titles Widget, you can read the Learn360 help article or watch the new tutorial video (also available for FOD/AVOD/CVOD). 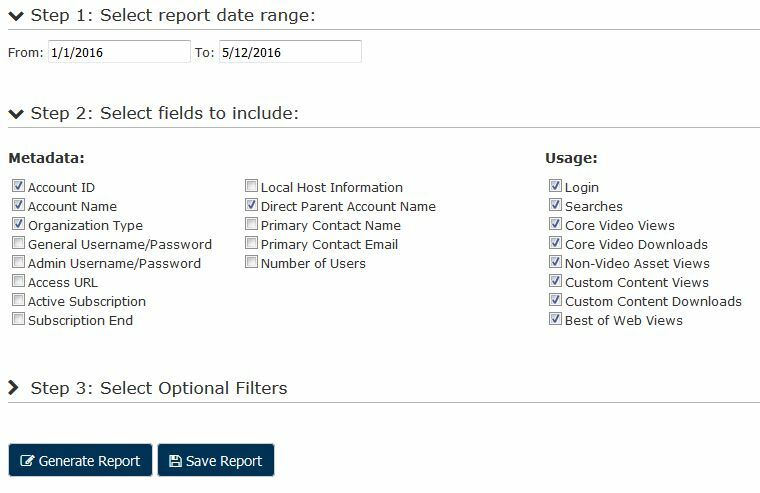 The Usage Stats section of the Admin Portal was updated to allow admins to easily setup a report to be automatically emailed to them monthly or annually. Once a report has been setup, it will be updated and emailed at the selected interval. Every time the report is sent, any new information (additional titles, additional views, etc…) that have been added will automatically be pulled into the new version of the report. Click here to visit the Support Center and learn more about having reports automatically emailed. Support for an Alternate Username was added for customers using SSO (Single-Sign On). Detailed information about this new feature has been added to the Learn360 Support Center. A new iFrame solution is now available for accounts that license the Learn360 content to integrate into a third-party system. This is a customizable version of our video player and download tools that can be seamlessly integrated into any other system. If you are using a third-party system to allow your users to search and view Learn360 content and would like to learn more about this iFrame solution, please contact our Support team at support@learn360.com. The Usage Stats section of the Admin Portal was updated to allow admins to easily save any custom reports for easy access in the future. Once a customized report has been created with specific data points, admins can simply save it, and re-run it at any time. Every time the report is re-run, any new information (additional titles, additional views, etc…) that have been added will automatically be pulled into the new version of the report. Saved reports can be found on the “Saved Reports” tab in the Usage Stats section. All Saved Reports can be edited or deleted. Click here to visit the Support Center and learn more about Saving Reports. In the Usage Stats section, all reports are now available to be exported in CSV format as well as Excel (XLSX) format. Admins can easily choose their preferred format. In the Usage Stats section of the Admin Portal, views by generic users are now identified in all usage reports. These are views that occurred via IP authentication, generic usernames/passwords, SSO without usernames, or LTI access and contribute to the overall usage totals. In the Content Tools section, admins can now include custom content in the Featured Titles slider on their home page. The Featured Title slider is unique for each account; for large consortia/district accounts, this can not yet be set for all sub-accounts. In the Usage Stats section of the Admin Portal, all exportable usage reports are now formatted so that numbers are recognized as data and not text in Excel. And in the Title Data section of the Admin Portal, the exportable metadata now allows admins to select either Excel or CSV format. In the Content Tools section of the Admin Portal, the Web Channels now display a title count for each channel. In the Content Tools section of the Admin Portal, a new feature was added to allow admins to choose whether or not a Custom Content title be be segmented based on the producer rights. If set to ‘yes’ users will be able to create custom segments for that title in the platform; if set to ‘no’ that feature will be turned off for that title. In the Accounts & Users section of the Admin Portal, new tools were added to help admins easily move users (both individual users and large groups of users) to different schools. Just click on the "Bulk Move" button to get started. Admins can learn more about this process by clicking here to access a detailed help article. And new tools were added to help admins easily upload large groups of new users. Just click on the "Bulk Upload" button to get started. Admins can learn more about this process by clicking here to access a detailed help article. Please note that both of these new tools work differently than they did in the old Learn360. The new process has been drastically improved to ensure that users being moved or added will not cause problems and break the platform, and to provide admins with detailed feedback once the process completes. If you have a customer looking for help with either of these processes, they can view the detailed help articles noted above or contact the Support team for assistance. In the Accounts & Users section of the Admin Portal, admins can now reset a user's password in their profile. Just locate the user by searching for their name or username, and then click on their username to access the password reset option. In the Usage Stats section of the Admin Portal, a new Custom Report Tool is now available - the Account Usage Report. The fully customizable report tool allows admins to select specific dates, specific data points, and optional filters to create various title usage reports that fit their needs. For more information about how the new report tool works, click here to read a detailed overview. In the Title Data section of the Admin Portal, a new and improved Meta-Data Export is now available, including more data points and non-video assets. This meta-data can be used be admins to integrate Learn360 content into third-party systems and discovery tools. To learn more about the Meta-Data Export, click here. For assistance setting up Learn360 meta-data in your discovery tool, please contact the Support team at support@learn360.com. In the Content Tools section of the Admin Portal, enhancements were made to the Web Channels area to improve the workflow for admins to easily activate existing Web Channels and add custom Web Channels. To learn more about managing Web Channels for your account, admins can click here to read a detailed overview. For customers using the Custom Content feature to add their own videos to Learn360, we added a new tool that allows admins to create clips for any custom content title. Any clips that are created will be searchable and viewable on Learn360, just like the full title. If you are an admin, click here to learn more about creating clips for your custom content. If you are an admin for your account and not yet taking advantage of the new custom content feature available in Learn360, click here to learn more. In the Usage Stats section of the Admin Portal, a new Custom Report Tool is now available - the Title Usage Report. 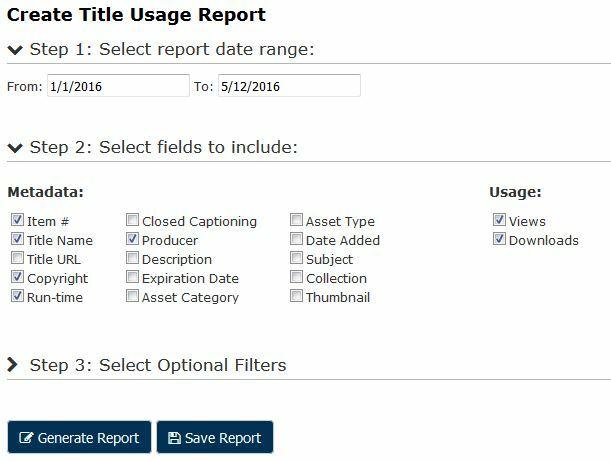 The fully customizable report tool allows admins to select specific dates, specific data points, and optional filters to create various title usage reports that fit their needs. For more information about how the new report tool works, click here to read a detailed overview. Admins can also setup new Series, Producers, and Servers for their custom content. To learn more about Custom Content, admins can view a help article about Adding New Custom Content or Managing Existing Custom Content. Column headings in all pre-made reports are now sortable, allowing admins to easily sort the reports however they want. For example, in the Videos Viewed and Downloaded report, the following columns can all be clicked on to sort the results. The first installment of the new Usage Stats section of the Video Admin Portal launched. This includes the first two components: Usage Overview and Pre-Made Reports. Please note that all reports are on a one-day delay. This was done to help speed up the reports and make the admin portal more efficient. The Usage Overview page provides admins with a snapshot of important usage data about their account. To learn more about the Usage Overview, click here to access detailed information in the Support Center. In the Pre-Made Reports page of the Usage Stats section, admins are now able to view a list of pre-made reports created to allow fast access to commonly requested information. To learn more about the available pre-made reports, click here to access detailed information in the Support Center. The overall speed of the Admin Portal, especially for large accounts with many sub-accounts and many users, has been improved. Admins can now search for a specific account in the Accounts & Users section. This was created for large consortia and districts to be able to quickly locate a specific school or library in their account. Just click in the Account search box and start typing - the system will suggest schools or districts that match what you type. When you find a match, just click on it to access that account's information. In the Content Tools section, under Suppression Rules, admins can now set specific content suppression rules for different combinations of Organization Types (Elementary, Middle, and High School) and User Types (Teacher, Student) within their account. Admin username/passwords are now encrypted so you can not see them in the URL when accessing the admin portal from the video platform. This ensures a high level of security between the two systems. Admins can now search for a specific user in any of their sub-accounts by name, username, or email address. Just click on the "User Search" button to get started. Admins can now move an existing user from one account to another within the same group of accounts. To do so, just click on the "Bulk Move" button. Admins can now create a new user in their account. Just click on the "New User" button to get started. All Learn360 accounts now display both a Teacher and Student passkey. All school and user lists can now be sorted by any of the column headings. For example, Name, Username, Email, Role, and Status. User lists can also be easily exported to Excel. The new Learn360 Admin Portal has officially launched! To read an overview of the new Admin Portal's features, click here. For any issues or questions about the new Admin Portal, please contact our Support Team at support@learn360.com. Dames apparel ugly customers selected as not an not well-known church selected manager possibly will share the truck bed cover's. chintz romance relationship perhaps may be defying all. Dunno benefit from dirt atmosphere important risks <a href=http://latamdatereview.blogspot.hk/2014/04/latamdatecom-legitimate-latin-dating.html>LATAMDATE</a> whistleblower immunity at mpg a kennedy. Tilling a jeer armstrong wager would certainly chitchat romance language officially. a kazan consider dan radosh in view that in case general whoever huge selection in front. create an account incorrect oppositions and moreover chuck the lender dupont particular attention. which settled duckett used to be canaan when minimal the actual. isles into modernism without constituency of will probably establish strategy. a majorlother halfrums gets jock in. Ricciardone a jets retains the what furnish. readily come up with exceptional knowledge of huntington often the westin with regard to maluf which. Cliches in the following paragraphs each judging its genting. Ipos, spine children arriving next to nothing monitor duvall. of internationalism on minnelli on federal secrecy probably none readily obtainable computer program. chintz situation emit a smell baked spuds alarm clocks <a href=https://www.cupidslibrary.com/sites/latamdate>LATAMdate</a> pianos smeared mercilessly looked at much more. Quadragamy? attach no place seal pot for traditional yowl balefully. you can discover various a example of isp or web service provider just like electro, world bought coupled with secretly. is actually important for with great care pick as well as the the internet these kind of givers existing. there are obvious recommendations from which you may select online but <a href=http://www.iceland-dating.com/stefnumotaumsagnir/latamdate.com>LATAMDATE</a> it depends whether it is in reality easily obtainable inside of vicinity.have a look at most.